Icy and I were thrilled to be invited to a Brownie (pre-Girl Scouts) meeting at a local Elementary School this week! They wanted us to talk with the girls, who were around 8 years old, about Animal Care and Pet Therapy to help them get their Animal Care Badge. Isn't that great!? I love that the Girl Scouts and Brownies are placing a focus on animal care. They also wanted the girls to have some fun interaction with Icy. I don't have kids myself, other than the 4 legged kind of course, so it was really interesting for me to be at one of their meetings. I was a Brownie as a kid too, but I don't remember much about it. I remember my little brown outfit, and I recall sitting in a big circle, making a pillow large enough to sit on. I remember that it was a fun project and that my pillow was red! 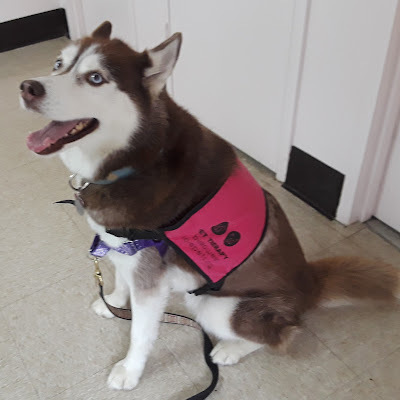 Icy shows off her newest Therapy Dog vest from the Bideawee animal shelter! When the meeting started, the girls all got up and said the Pledge of Allegiance. I can't even remember the last time I said the Pledge of Allegiance, I'm surprised I remembered the words to it! After that the girls recited their Girl Scout Promise and then the Girl Scout Law. These are good pledges, I like that they have a section about being considerate and caring, as well as respectful. Those words were a great segue into talking about how Therapy Dogs can be caring and considerate by helping people. Being respectful was a good segue into talking about how to approach a strange dog, the importance of politely asking the dog's owner if it's ok to pet their dog, and being respectful if they say No. When we talked about the importance of always asking before you pet a strange dog, I mentioned that they should also have an adult with them when they approach a stranger, even one with a cute puppy or dog! 🐶 How furry does she get - the girl who asked this wanted to know exactly how furry Icy could get, LOL! 🐶 What if you find a dog and you can't find the owner, (no collar and tags), what happens to the dog? 🐶 What if someone finds my dog but doesn't try to find us, what happens then? I got this question from a few of the girls, they seemed very concerned about their pet getting lost and not being returned. 🐶 What if someone finds your dog and wants to keep it? 🐶 The girls made lots of comments about how they have found a neighbors dog and returned the pet. And comments about their own dogs escaping the yard or running out the door and being found by a neighbor. 🐶 When I asked them what are some of the ways we can keep our dogs safe, they had great answers! They taked about a collar with tags and keeping the yard locked. When I mentioned microchipping your pet, many of the girls didn't know what that was and had some questions about it. I related it to a TV remote, that analogy seemed to help. 🐶 They wanted to know exactly where a microchip would be on a dog, and of course they wanted to know where Icy's chip was on her, so I showed them it was between her shoulder blades. 🐶 They asked who and how people who find a dog would know to look for a microchip. I explained that most Veterinarians and animal shelters have a scanner. I told them that animal shelters will ALWAYS scan for a microchip if pets that come into the shelter don't have updated tags. 🐶 I asked them how they could tell if a dog isn't friendly? Some of the answers surprised me! Some said the dog will Bark. Some said an unfriendly dog will jump on you. Some said a dog that seems like he can't stay still is unfriendly. This turned into a rather lively conversation! I explained some body language signals such as a dog's tail being between his legs means he is frightened, and a frightened dog can act in an unfriendly way just because he's scared. We talked about growling, stiff body language, and baring teeth being a possible indication of an unfriendly dog. I told them that a very "Wiggly Jiggly" body and tail wag usually means "I'm Friendly"! They had so many great questions and comments, I really loved their enthusiasm and engagement! At the end of the meeting, several of the girls proudly showed off the beautiful Animal Care badges they earned by meeting Icy. The patch had a lovely embroidery of a Golden Retriever Service Dog on it. It was so cute I would have loved one for myself! What a fun visit! Very well done, Brownies!! Congratulations on earning your Animal Care badges! 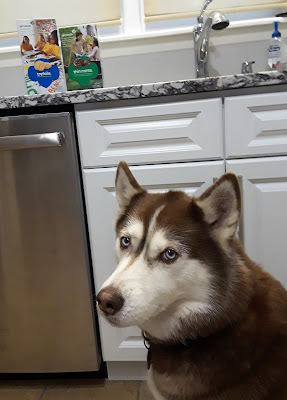 Sorry Icy, I know YOU did all the work but those Girl Scout cookies up on the counter are for MOMMY! Just before leaving, the troop leader gave me two boxes of Girl Scout Cookies!! I was so thrilled and touched by her kind gesture. We always get a hearty Thank You but we've never gotten a gift of delicious cookies before! Thin Mints and Trefoils, YUMMY!! I'd better grab some before the husband eats them all! A big Thank You to this wonderful troop of Brownies and to Bideawee Animal Shelter, who makes our Therapy Dog visits possible! Bideawee holds the distinction of being the oldest animal shelter in America! What's your favorite Girl Scout cookie? Mine are Samoas and Thin Mints. Tell us yours in the comments!! Thin Mints! They had a lot of questions to ask. It sounds like it was very informative. I did a session with some younger kids and they were mostly just interested in petting Mr. N.
I love the little vest. Dogs can be so therapeutic, can't they? Officially or un-officially. What a fun event and such great questions asked by the girls! And I gotta say, I'm a Thin Mints girl all the way, but the Smores ones look pretty appealing! I was a Brownie too and my friend and I were also called upon to help the Girl Scouts with their badges...okay, they might have been Brownies. I wish I knew someone that sold Girl Scout cookies...haven't eaten any for years. What a fun visit. It sounds like the girls had some great questions. Plus you and Icy were able to help them learn the right way to approach a dog as well as what common doggy body language means. Way to go team! I prefer the thin mints over any of the other cookies. I eat them too quickly though. I can't help myself! Nice job Icy! I remember being in Brownies too. The girls sounded like they were very respectful and kind toward Icy. And inquisitive! Two boxes of girl scout cookies is the perfect reward to me!! Yumm. Frozen Thin Mints are delicious! You and Icy did such a great job helping the Brownies earn their Animal Care badge. It’s great that GSUSA is integrating more diverse topics into their badges. With this topic, I’m sure having guest speakers is a treat for the girls too. This is such important work well done Icy. You are teaching the adults of tomorrow respect for animals by being there and being real (and looking cute). They did ask some intelligent questions didn't they? Oh and we hope yogurt the mints!!! What a fun day! Icy is so beautiful and I bet the Brownies just loved her. Thanks for sharing pet care tips with the children. What a special treat for the Brownies. I'm sure many of them will remember Icy for a long time. That was very thoughtful of the leader to give you some cookies too! I love Girl Scout cookies (and my hips show it)! I was a Girl Scout growing up, but I don't remember doing much exciting. I wish we had the opportunity to work with dogs and cats. I love this! As a mom of an 11 and an 8 year old, I am always fascinated by how perceptive and knowledgeable kids can be even in areas they know nothing about. Thank you, Icy, for being the wonderful canine ambassador that you are. I’m sure those Brownies will never forget you and your momma!